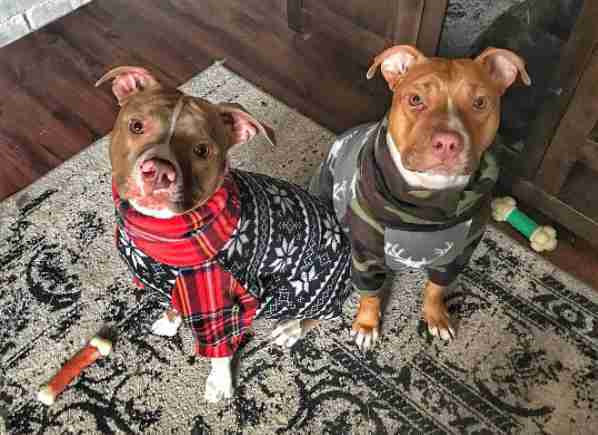 They had to spend four months in onesies — but now their fur is all grown back. The six puppies were on fire. 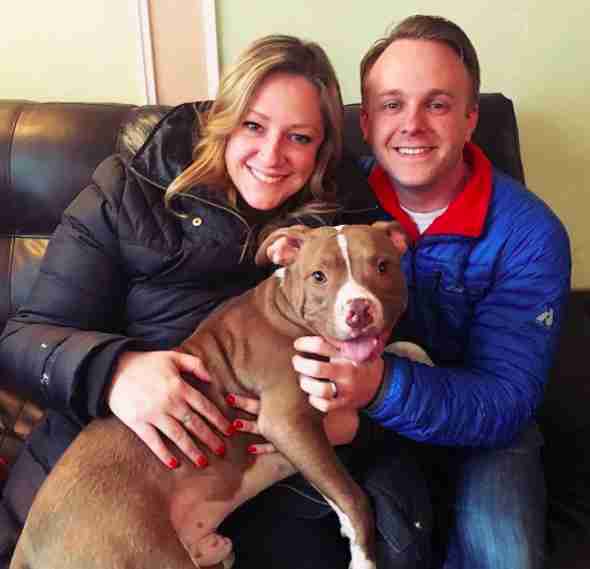 At least, that's how they felt to Kristina Rinaldi, executive director of Detroit Dog Rescue (DDR), when she picked them up from animal control. "When I say that these puppies were literally on fire, they were on fire," Rinaldi told The Dodo. "They were just burning up. They had high temperatures." 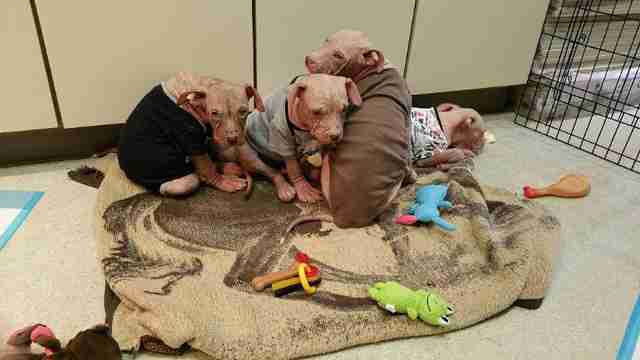 Besides having dangerously high fevers, the puppies had severe cases of mange - so much so that they were pink and hairless and had painful sores all over their skin. 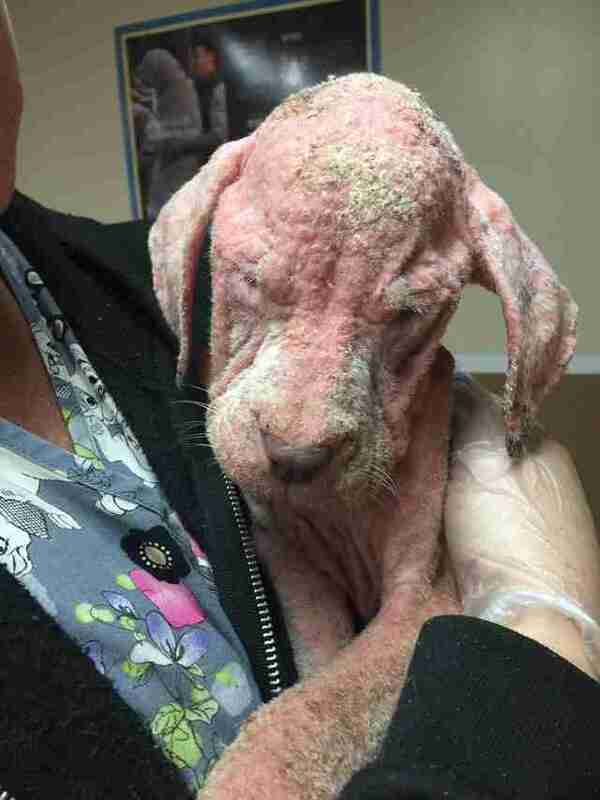 "I've seen a lot of mange cases in my dog rescue career, but this was the worst mange I had ever seen," Rinaldi said. "Their lymph nodes were swollen. Their eyes were swollen shut. Their skin was peeling off." 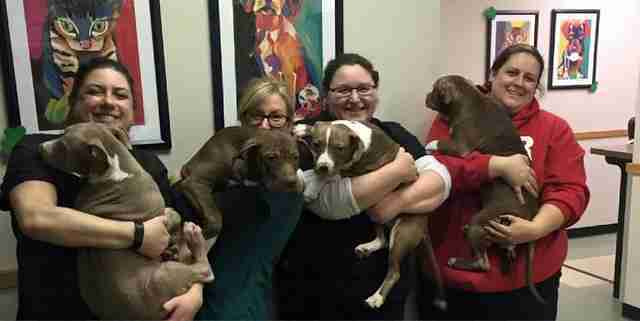 These six puppies came into Rinaldi's care in November 2015 after they'd been seized from an abandoned house in Detroit, Michigan. At the time, the animal control shelter was at full capacity, and they didn't have the resources to care for these puppies. So the shelter manager reached out to Rinaldi, and asked if DDR could help. 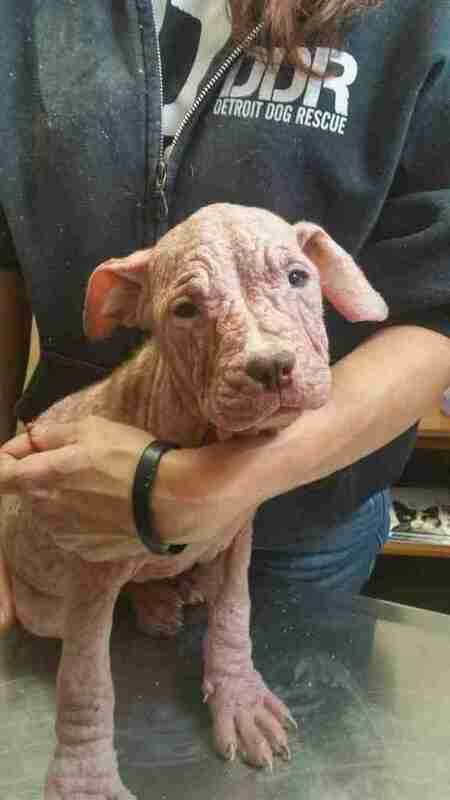 "The manager actually said, 'How do you feel about hairless puppies?'" Rinaldi said. "And I said, 'What?' She texted me a picture of the puppies, and I said, 'We'll be there to pick them up in a little bit.'" 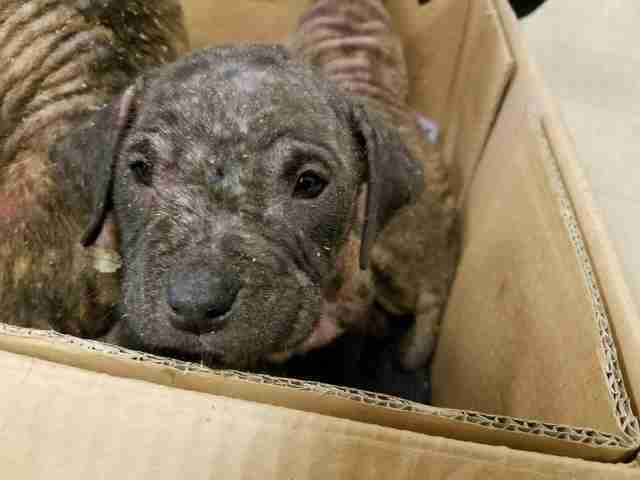 A team of DDR volunteers rushed the puppies to a vet. But for two of them, help came too late, and they passed away by the time they arrived at the clinic. The others were barely holding on. "The veterinarian said, 'We're working against the impossible,'" Rinaldi said. But Rinaldi refused to give up. Medical staff confirmed they could alleviate the puppies' pain while treating them, so she decided it was worth the fight. The four puppies, whom the DDR volunteers named Wilbur, Petunia, Pinkie and Arthur, stayed in medical boarding for about 12 weeks. "We would visit them every day," Rinaldi said. "We also have a great support system of veterinary technicians." 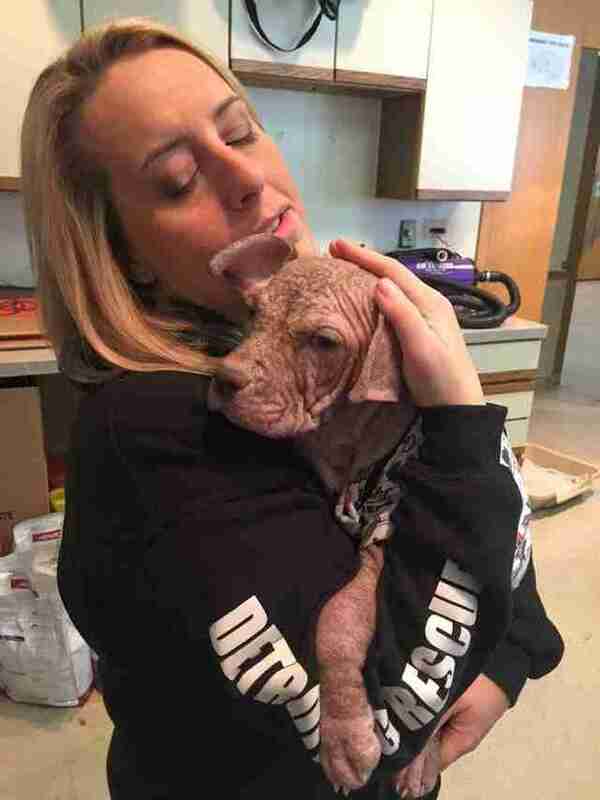 When the puppies were eventually released into foster care, they still needed around-the-clock attention to continue treating their mange. "Mange is caused by tiny insects called mites," Dr. Danielle Cobiella, a veterinarian with BluePearl Veterinary Clinic, told The Dodo. "Some mites cause scabies, which involves extremely uncomfortable itching that can lead to skin diseases. 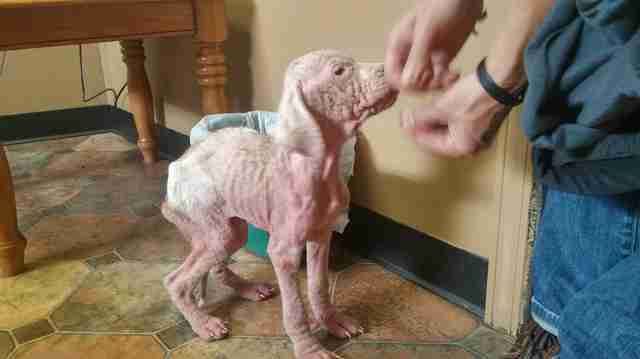 Scabies makes dogs absolutely miserable. Another type of mite lives in the hair follicles and can also cause itching." To help the puppies' itchy and tender skin heal, the DDR volunteers also dressed them in baby onesies. "Everybody on our team who had had a baby dug into their boxes and brought baby onesies in for them because their skin was so delicate," Rinaldi said. "They lived in baby onesies for about four months." Eventually, the puppies' fur started to grow in. It started as peach fuzz, but after about six to eight months, their full coats grew in. And once the puppies were healthy, they were all adopted into loving homes. 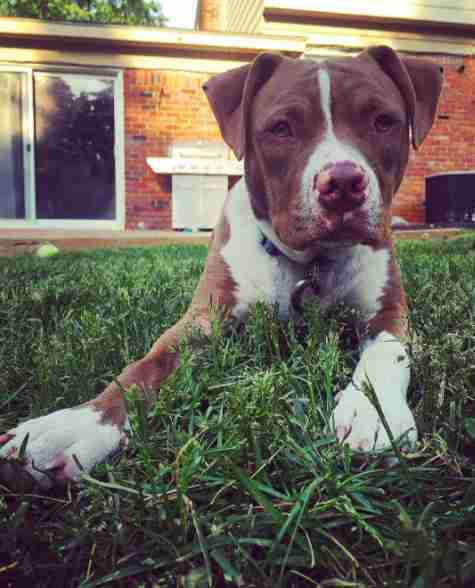 Beth English, a DDR volunteer, is the one who adopted Wilbur. "We gave [Wilbur] a beautiful home with a huge backyard to run around in," English told The Dodo. "He's got a puppy brother from another mother who also lives with him. They're both the same age – 2-years-old. And he's spoiled like hell. My husband and I decided not to have kids, so these are our kids. 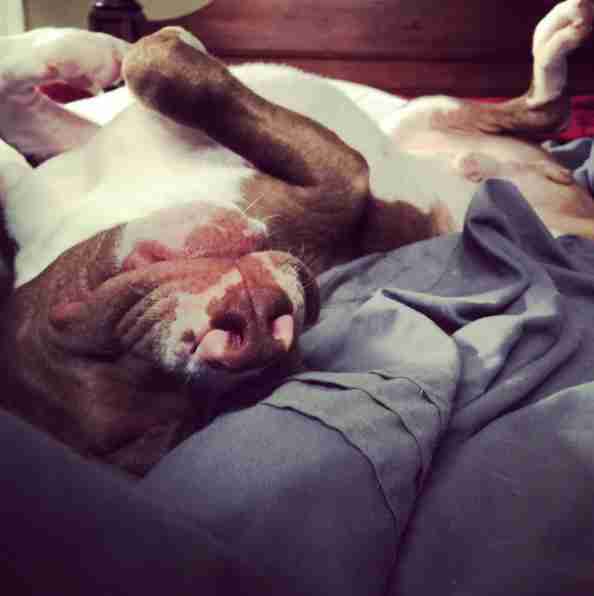 He has a life of luxury." Despite the medical issues he had as a puppy, Wilbur now has a clean bill of health, English said. And this is all thanks to Rinaldi and the other DDR volunteers. "DDR takes on so many dogs who have been stabbed or shot or have the odds just stacked against them, and time and time again, we say, 'Let's sit back and assess the situation,'" Rinaldi said. "And ultimately, we always make the decision that if you try hard enough, you can do this. Nothing is impossible." While Wilbur, Petunia, Pinkie and Arthur already have their forever homes, there are plenty of other dogs up for adoption. If you're interested in adopting a puppy or dog, contact DDR. You can also help DDR rescue more animals in need by making a donation.